Granite of two micas, with light blue-grey colour, homogeny, compact and reasonably healthy. 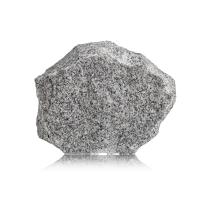 Granite of two micas, medium grain, light grey colour, homogeny, compact, relatively healthy with a small foliation, defined by the tendency for one orientation sub parallel of the micas. The quartz is grey, transparent anf forms rounded grain and aggregates that, usually have 2mm, but, sometimes can have until 4 to 5 mm. The feldspars are white or light yellow and forms long crystais and aggregates that, usually, have 4 to 5 mm but, sometimes, can have until 10mmx5mm. The biotitic has black colour rand long forms that, usually have 2mm to 3 mm, but can have until 5mm. The muscovile forms separed silver crystals that usually don't have more than 2mm to 3mm. Notes: Images may not represent 100% physical stone.